Set within 1¼ acres of well-established tropical gardens, Dolphin House is the perfect location to experience the magic of this captivating island. 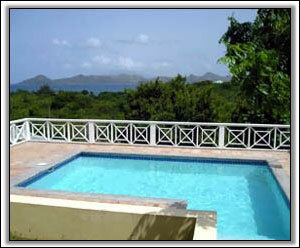 The property enjoys an elevated and extremely private position in one of the best residential areas on the island. 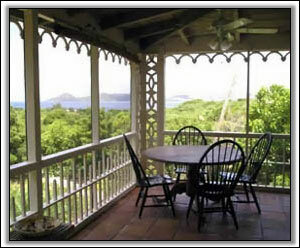 It affords breathtaking views over the Caribbean towards the sister island of St. Kitts, particularly from the pool and the verandahs, and an uninterrupted view of the spectacular sunsets. Within a short stroll of the beach and a number of restaurants providing a varied selection of cuisine and ambiance, the property consists of two individual traditionally designed and tastefully decorated cottages separated across the garden by the pool. It is also within easy walking distance of Oualie Beach (one of 5 beaches within a half mile radius), the hotel and its water sport facilities, and only a 10 minute drive to a first class golf course (at the Four Seasons Resort). The main living area is in fact the covered verandah, which runs along two sides of the villa and has insect screens all round. There is a sitting area with comfortable rocking chairs and an antique oak settle with cushions, and a dining area with a lovely old pine table, which is ideally placed to take full advantage of the view. French doors from the verandah lead into the living room with a sitting area with a sofa, coffee table, oak antique dresser, telephone and a selection of books. The kitchen area is fitted with attractively painted yellow and white units, and has a gas cooker, microwave, fridge/freezer, coffee maker, toaster etc. and a small breakfast bar. The double bedroom has a queen-sized bed and ensuite shower room with shower, basin & vanity unit and WC. There are ceiling fans throughout the property. A generous supply of towels is provided, and there is a hairdryer in each cottage. 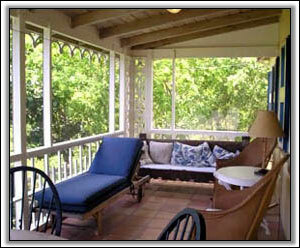 Accessed across the garden from the main house, this delightful cottage has its own private verandah with similar views across to the Caribbean. 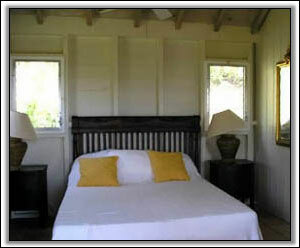 The bedroom has a queen-sized bed and ensuite shower room with shower basin and WC, and a walk-in wardrobe/closet. Although there are no separate cooking facilities, a small fridge and electric kettle are provided, so that guests staying in the cottage can enjoy morning coffee/tea and a glass of chilled wine/beer watching the sunset from the privacy of their own verandah. There are ceiling fans throughout the property. 1¼ acres of fenced gardens, with gated access to a drive and parking areas, comprising of lawns with flowering shrubs and trees, paths and a swimming pool with Mexican saltillo clay tiles sun-bathing area all round and sun beds. A few essentials to start off your holiday, including breakfast items and wine/beer for that first evening on the verandah. 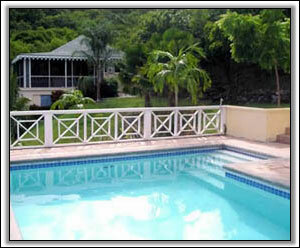 Staff: Maid and Pool cleaning service is provided twice weekly. The housekeeper will also launder any personal clothing, on request. If you would like to hire a cook for some or all of your stay, please let us know. 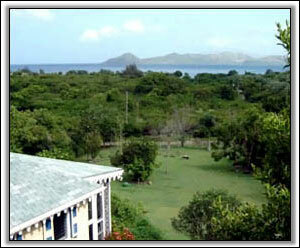 Agent: Deby, our agent on Nevis, will be happy to help ensure you make the most of your stay. Car Hire: Although not essential as taxis and buses are plentiful, to make the most of your holiday, we would recommend hiring a jeep/car for at least some of your stay. Rates: The owners will also consider discounts for late bookings, subject to availability. As well as offering an excellent level of privacy to groups of 2 couples, the property is ideal as a romantic getaway for honeymoon couples, and as a peaceful haven for artists, writers, nature lovers and sun-worshippers alike. For this reason, the property is offered on 2 price tariffs with a reduced price for 1 to 2 people.